So- its funny to have such perfect pictures on the blog today and have real life currently feeling completely opposite right now. I'd wear that outfit right now as I speak- but picture bloodshot eyes and huge bags under them. How's that for honest? We've been hit by the giant bus called Christmas orders and although we asked for it and are conceptually feeling amazing about it- the living through it is proving to be difficult. I'm trying to walk the fine line between complaining that life is hard and keeping my mouth shut because I don't want to be ungrateful. When I step back I am so, so, so happy that we have hit my super high dream-come-true kind of goals already this year. But day to day I wonder if we are going to survive it! I wish there was a book (if there is, send it my way!) or a blog post about what life is like as you grow a successful business. I have role models that I look at and I wonder- was their life this messy while they were building their dreams? Did they order take out multiple times a day? Did they have overdue bills and late vehicle registration because the papers got lost in the stack of mail they don't have time to look at? Did they have a totally disgusting fridge, closets, van and piles of unfolded laundry? Did they develop a reputation of being ridiculously late and undependable? And I promise it's worse than that. We are working through it and obviously success is a great problem to have- don't take me wrong. Just wanted to check in with an- I'm struggling post. Cuz when am I not? Thanks for letting me vent. Thanks for your patience if you are waiting on an order. 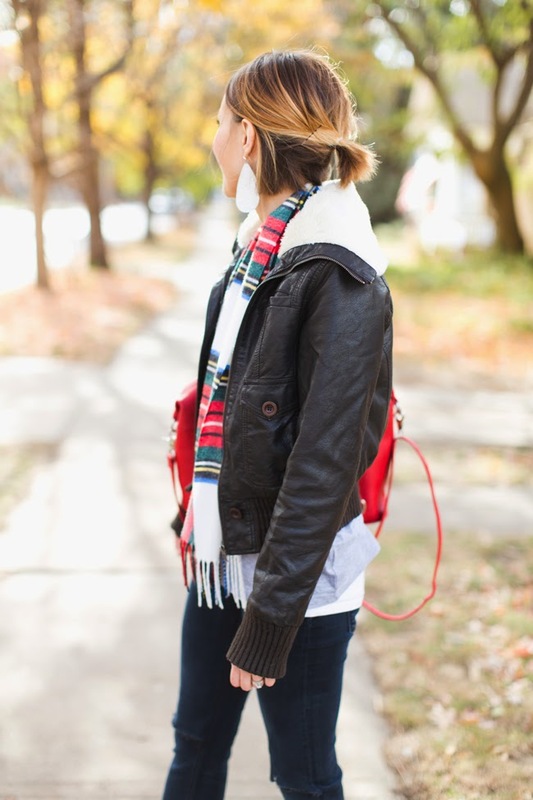 You can never have too many jacket and scarf options as winter approaches. 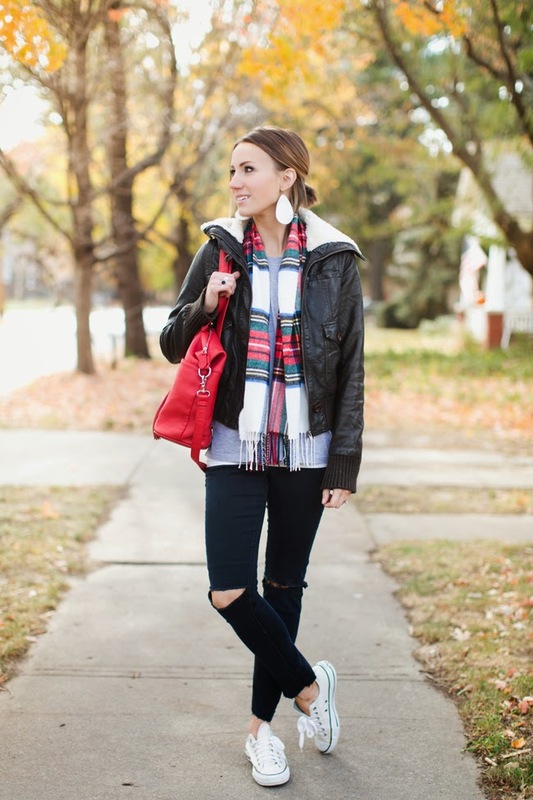 I wear a lot of basic tees with distressed denim so to make things interesting I love adding a trendy jacket like this shearling one and patterned scarf. 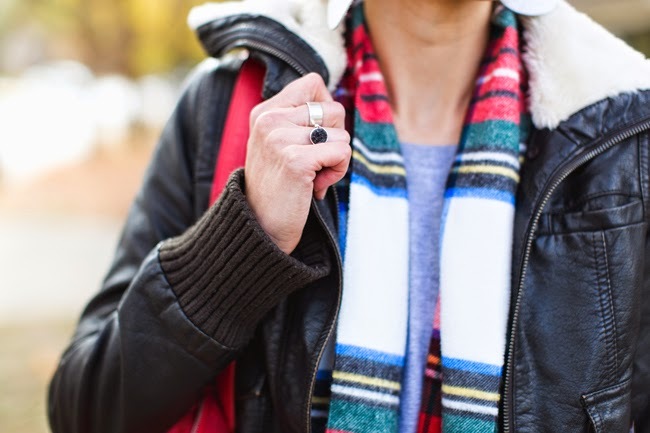 Scarves are cheap at thrift stores and if they are short like this one- draping it with your jacket is an easy way to wear it. Even in the Winter my Converse get plenty of wear because as a Mom of three boys I'm always on the move. And yes, my ankles were cold. If I was chasing my boys- they would be just fine. What thrift stores do you recommend? I never find anything that cute at thrift stores in the northland. I always have good luck at Savers. I worked from home on Monday, as my girls were off of school and thought of you then. I pondered to myself, how does Kilee do this every day, with three little boys and a business?!?! I think it takes a whole lot more to work from home, than to work from a dedicated office space. I am admire your skills! You really do look great! I'm sure you and Soren will get a system figured out with the business soon. How amazing is all your success! I'm really so happy for you all, but I know what you mean about having a messy house, it can be hard for me to focus when I'm feel surrounded by messes. What kind of basic tees do you wear? They always look so cute! Nm I found it on your blog. :) If you are wearing the men's basic v neck tee, do you size down? 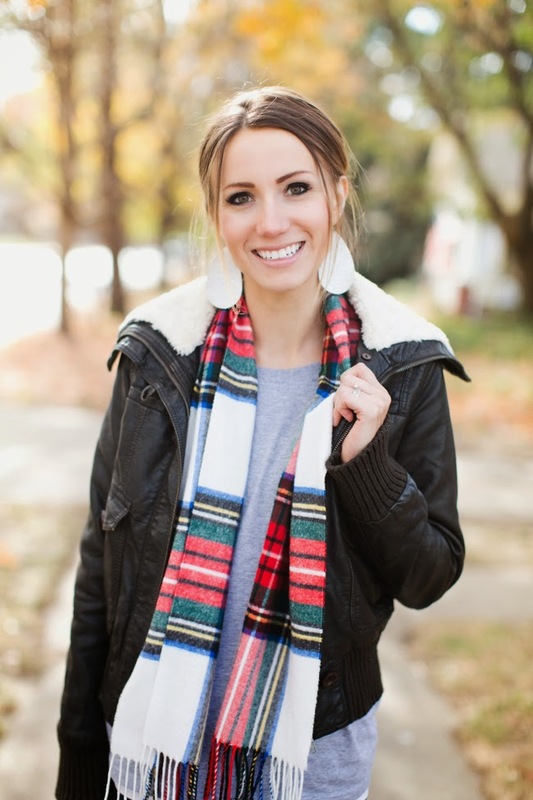 Love the plaid scarf! You can never go wrong with basics! Add in a great accessory and jacket and you have a winning outfit! Love it!